Testing the smartest active down jacket of the season. Helly Hansen Odin Veor. There’s been a big buzz lately with the new Odin veor Jacket by Helly Hansen. 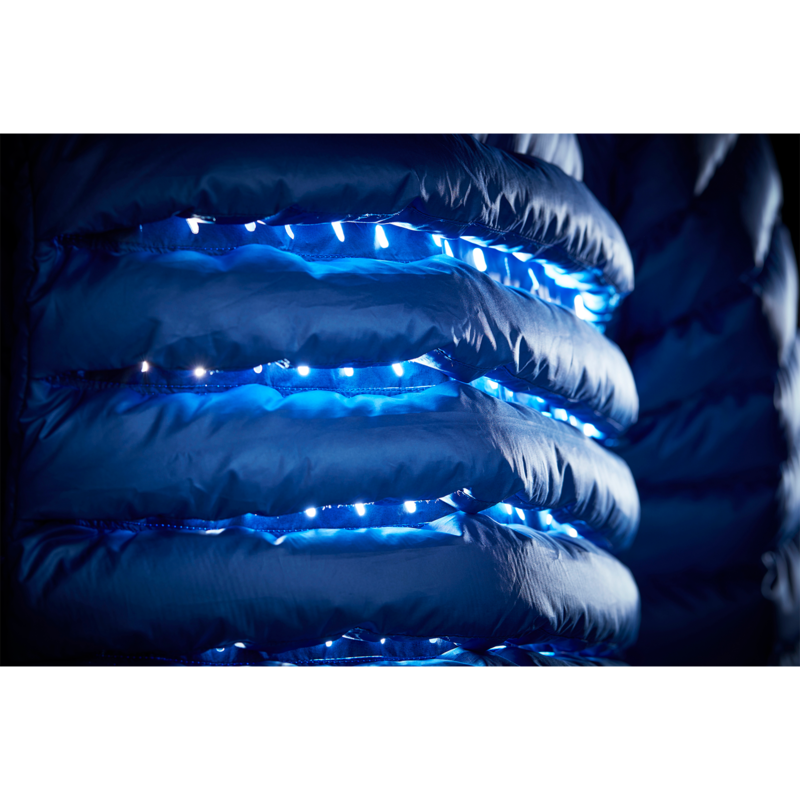 You’ve probably read about the “air conditioned puffy jacket”, the “ultimate airflow jacket”, “the intelligent jacket” and so on. 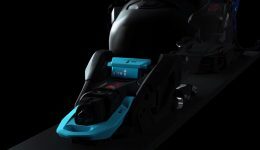 Well, I’ve been testing it intensively over the last two months, mostly on ski touring days, overnights in refuges (non heated), alpinism and just one day of climbing. Well, coming back to the Odin Veor down jacket, at first sight, your eyes will definitely go straight to the back panel. On the mid back area, the layers of feathers are constructing in a way that air can flow under them, aiming to ventilate the moisture trapped inside the jacket. Overheat, and moisture tend to be the number one problem of puffy jackets, especially during the activity. But does this clever solution works? I like simple solutions, because they tend to work. It’s kind of funny how for so long manufacturers have experimented with different fabrics, sealings, treatment on the feathers, combinations of feathers and more active fabrics, but no one has tried to put holes on a certain way so they are not overexposed and do not affect the feathered panels before. 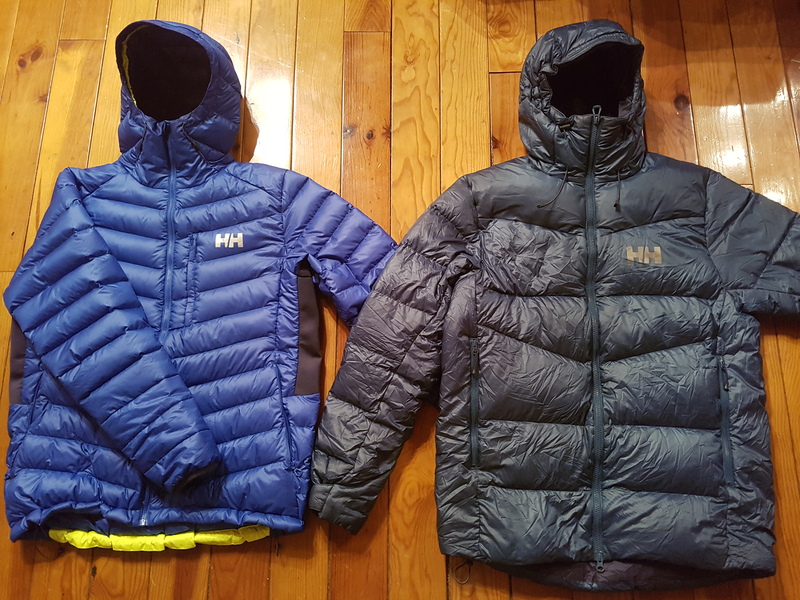 Helly Hansen has tried it and it seems to work, but in my opinion there is way more to this jacket. I’ve had all kind of feathered down jackets; all the way from belay jackets, to very “puffy” jacket, to all kind of active down jackets, even quite a few of those hybrid layers. Thin, thick, natural, synthetic, treated with primaloft hybrid construction…you name it I’ve used it. However I can easily state that overall, this has been the best active down jacket I have ever had. When you use the jacket as the outer shell, specially without a backpack, you can really feel the air flow. It doesn’t make you cold. There is no funny wind blowing on you. 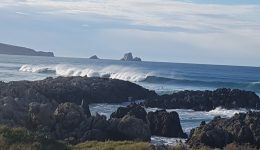 However iI will rather keep you warm without increasing the moisture during the activity while you play it a bit smart with your body rhythm and breathing. 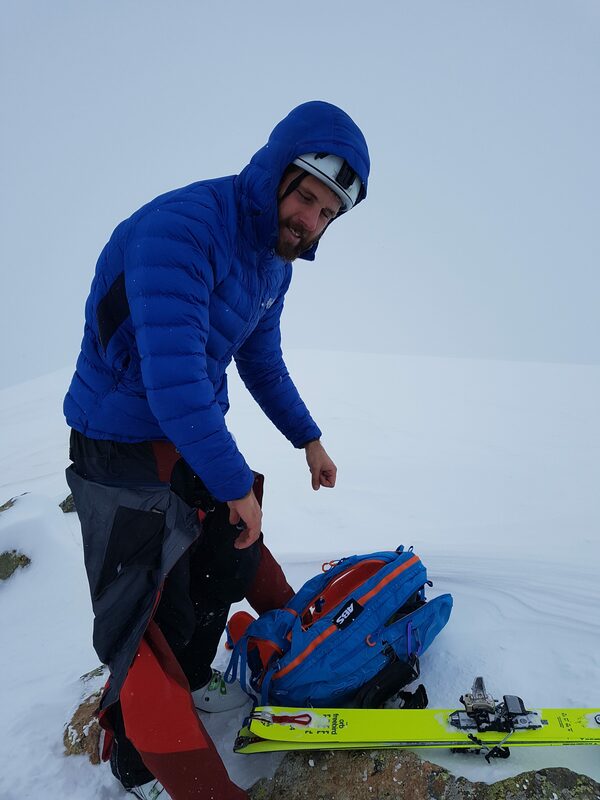 However, In winter, generally we will use an active down jacket as a mid layer under a three layer shell and with a backpack. In such situations I’ve been happily surprised. 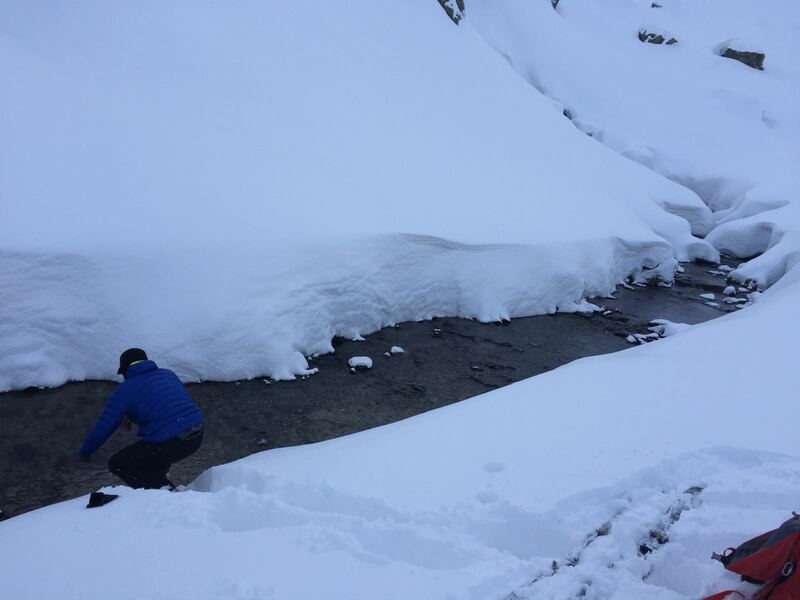 At the beginning of december we had a period of heavy snowfalls with temperatures up to -21ºC. On those days, the plan was freeriding around the resort. 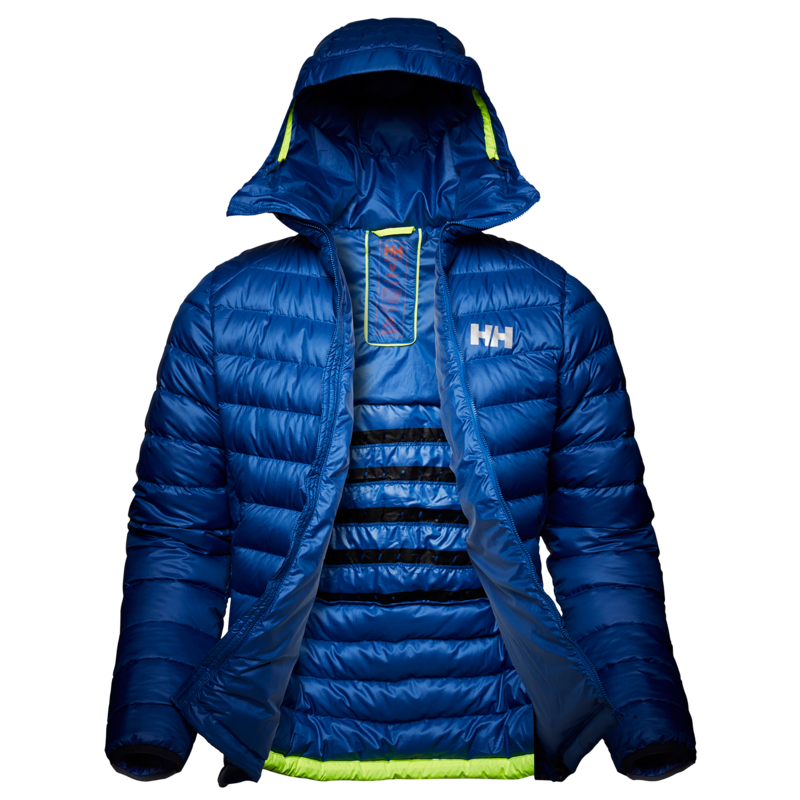 I was tempted to go for a thicker feathered jacket that is an outer shell, or taking the Helly Hansen Vanir Icefall down jacket that is incredibly warm as the mid layer. However, I decided to still take the Odin veor down jacket just for the sake of the test, even though I was pretty much biased that I probably was going to freeze. Surprisingly I did not got cold at all in my core even though all my beard couldn’t be any more frozen. From then on, I’ve used it everyday as my midlayer when I go skiing on the resort. When I use it under my three layer jacket and the backpack, of course I don’t feel the airflow in my back, but one thing is for sure, I always seem to be close to my optimal temperature, from extreme cold days, to days that it’s barely under zero degrees. I’m never too warm, never too cold and I don’t oversweat. I hardly achieve this when I go for a feathered down jacket as a midlayer. 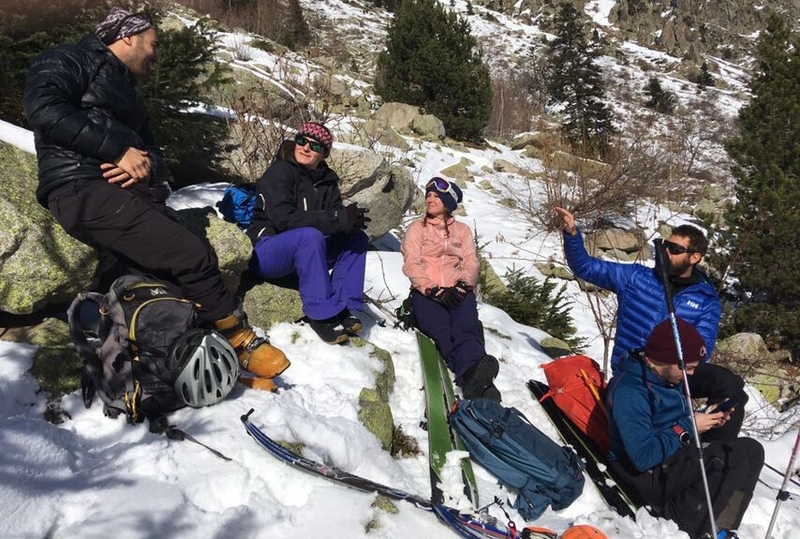 What happens when you go for more aerobical activities such as ski touring? Over the last two months I’ve probably gone ski touring around three days a week and I have always brought the Odin Veor jacket with me. Now it’s always on my backpack, that must say something. That’s a new habit to me, before I was never a big friend of feathered down jackets for ski touring and I was only taking them to very specific situations. I’ve found the odin veor so polivalent and adaptable to different weather conditions that it always gives service. 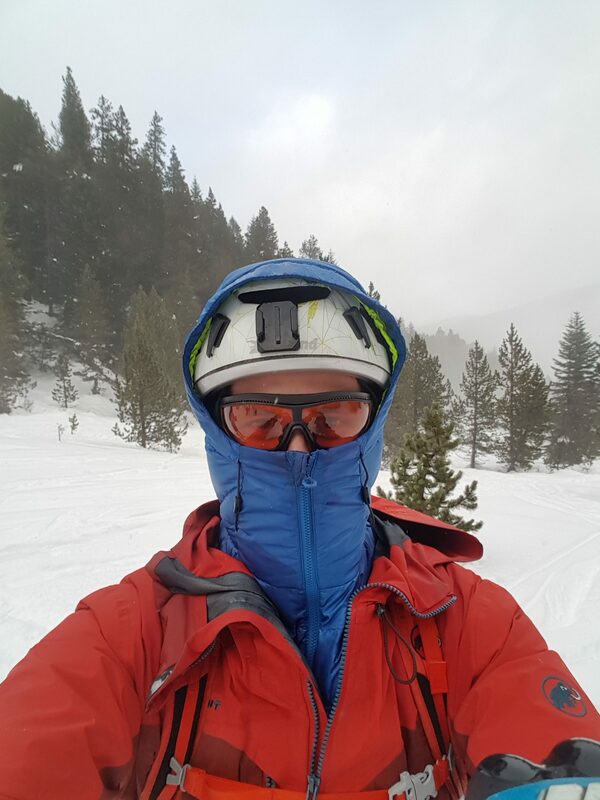 Of course it won’t work if you keep sprinting at your maximal anaerobic level, but you can ski uphill at a moderate level before getting all sweaty significantly longer than with several other active down jackets that I’ve had. 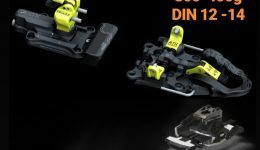 ONTHEBELAY Reinforced tech bindings for Free touring. Aside from thermal insulation, it is designed for the activity. The side panels are built on a stretchy primaloft fabric, that gives flexibility, and reduces the volume allowing freedom of movement for the arms. This black panels also allows a certain amount of airflow in the armpits and on top of that there is a zip in between them and the chest for extra ventilation. The jacket adjusts tight in the wrist and if you pull it backwards it stays there. 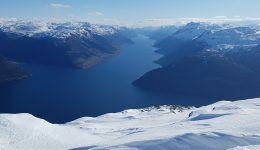 All those features make its comfortable while rowing with the poles, doing technical moves with the Ice Axe and even the day I took it climbing, I wore it just for the test, (it wasn’t really cold or necessarily), and it worked fine. 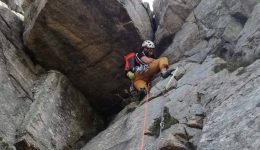 I just took easy pitches, because it’s not smart to take difficult pitches with a puffy jacket, there is too much scratching and stretching against the rock and down jackets don’t stand a chance, especially against granite. 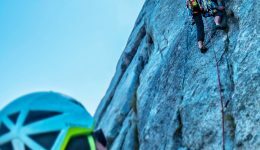 I felt like I want to test it climbing on multipitch activities on cold days, as it’s packable and light as to have on the harness or on the multipitch backpack. 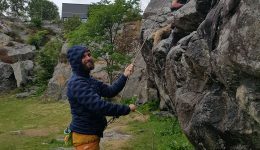 I will update the test on such activities when the rock climbing season will be back. The hood is a winner. Especially when doing the transitions on bigger mountains. When I climb bigger mountains, generally the last bit of the mountain always implies a bit more of alpine ground. Generally on such situations, I get the crampons on or at least the helmet. Towards the summit it’s always windy; the problem is that my climbing helmet doesn’t really cover my neck and ears and it doesn’t get any comfortable with a buff or hat under, hence when I reach the top and it’s time to do the transitions, generally I’m cold on my head. 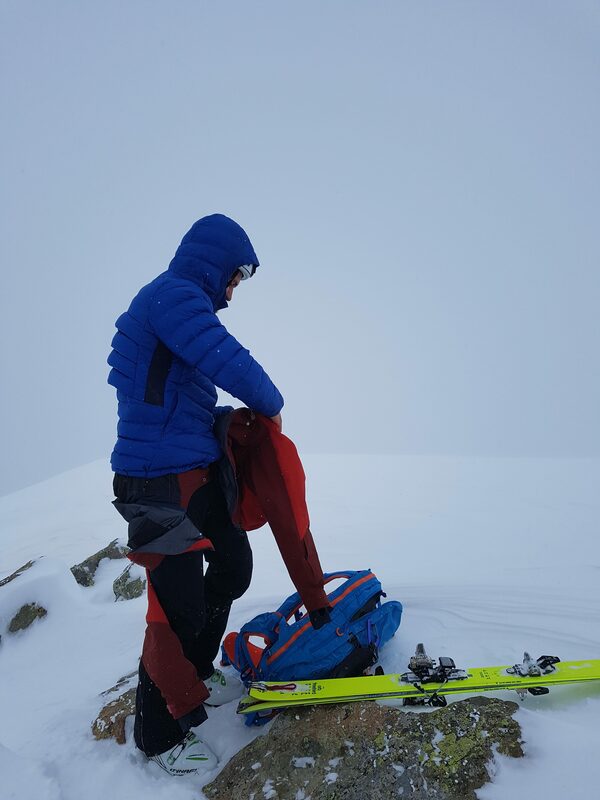 As soon as I reach the top I go for the Odin Veor down jacket, I can easily zip it and cover my helmet with the hood, then I zip over my three layer jacket and then it’s time to start doing the rest of the transition before the downhill. 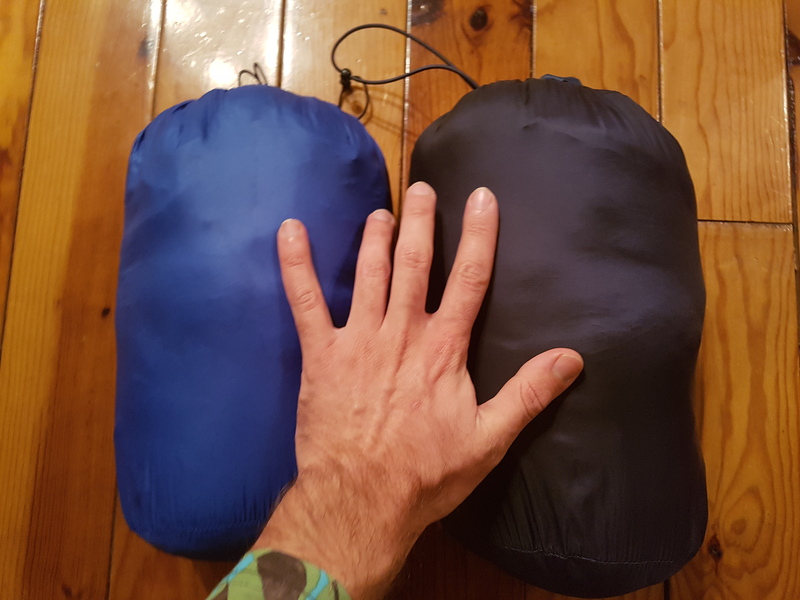 Regarding packability, you can compress it with ease on the compression bag that comes with the jacket, then it becomes pretty much the size of my crampon bag. To me it’s not much space for the service it brings, and that’s one of the key reasons why now I always bring it with me on winter activities. 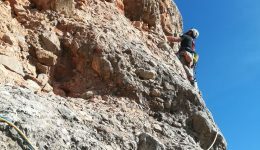 How about insulating when you are done with the activity such as on belays or on refuges? For this part of the test I’m going to compare it one more time with the Vanir Icefall down jacket. As you saw on the last test I was very happy with it for bivouacking, belaying and as the insulating layer on the refuge. Here you can see how they look side by side, and how they look packed as well. The vanir Icefall is significantly warmer. It’s longer, blocks colds from the lower back, it’s doubled with primaloft. It is pretty much a sleeping bag and surprisingly compresible. For the last refuge overnight I took the Odin Veor down jacket. 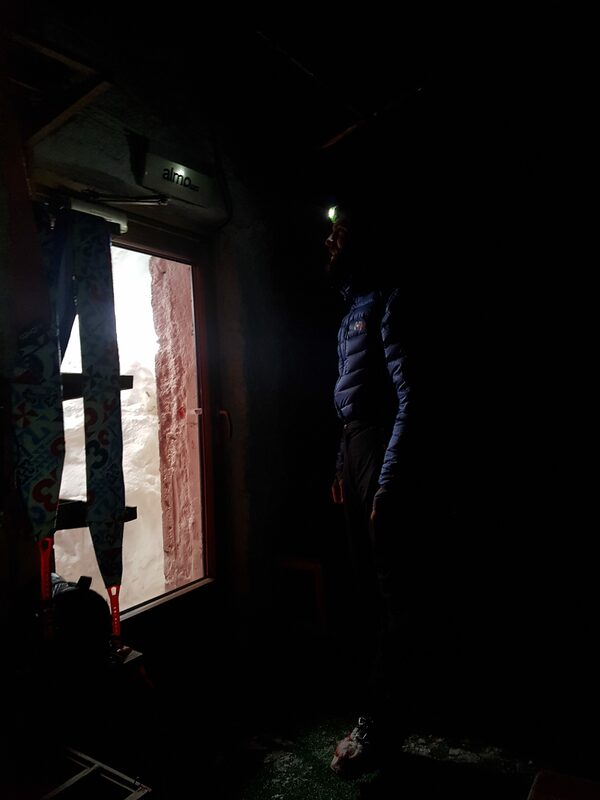 That night the temperature was around -7º, we didn’t achieve to put the heating on the refuge and temperatures were for sure negatives inside as the next morning the snow that we carried inside with the boots didn’t melted. Inside the refuge and while having dinner I was wearing a light base layer, a thin primaloft midlayer and the Odin Veor Down jacket, and it worked just fine. I was not cold. For the night we didn’t brought sleeping bags, but we could use four blankets of the refuge each. Again I was not cold at all during the night, actually rather warm but I was a bit afraid of unzipping or removing one blanket. Since that day now I will probably stick to the Odin Veor down Jacket for overnighting activities on refuges. It doesn’t take much space, it works incredibly well as an active mid layer, and I know it should be alright in the refuge even on cold nights that we don’t achieve to make a fire. However for bivouacs, long camp nights and similar activities with more exposure I will still stick to the Vanir Icefall. As you can tell I’m quite excited with it. When things are done right, one must recognise it and Helly Hansen has just figured out what an active down Jacket must be. It’s not just about some little holes on the mid back panels, but the overall that will give service in a really broad amount of situations. 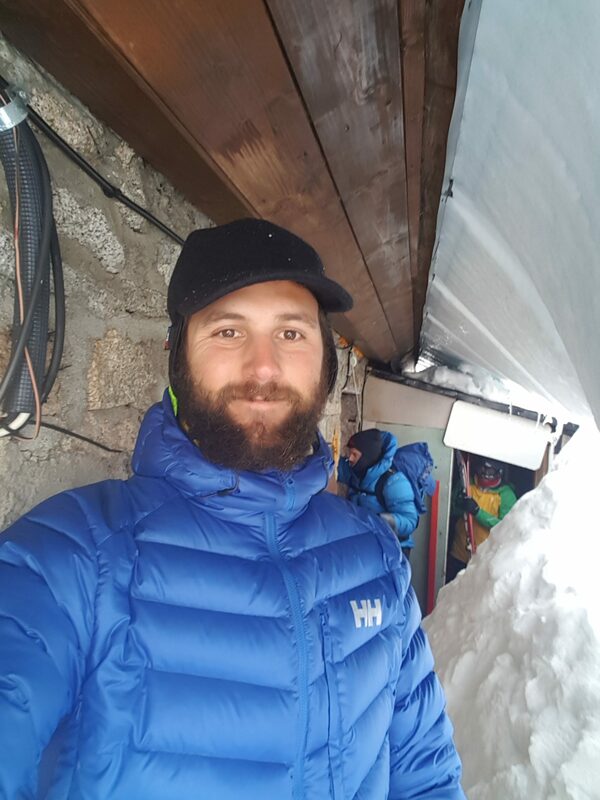 This entry was posted in Gear Guides and tagged Alpinism, MountainSki. Bookmark the permalink. 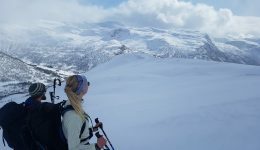 Thanks for the review….I just bought the women’s version of the Odin Veor for a winter hike/ice climbing up Mount Washington and was beginning to get concerned about being warm enough since I tend to run cold all the time. 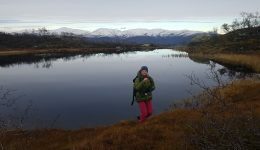 I even thought about buying an expensive arcteryx since it seems to be used by many more experienced outdoorsmen so I was glad to read your review. I feel more confident now that I will be sufficiently warm (with a couple more baselayers than what you wear). Thanks again! Thanks Lilly for your coment. let me know your impressions of it and how it performed on mount Washington! 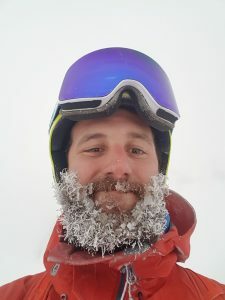 This weeks I’ve been having it as well on a ski touring trip and it has been a good eample of holding everything. THursday was a rough day with temperatures around -17 and gale force winds even though it was sunny. That day I had a thick merino wool baselayer, odin veor as mid-layer and a gore-tex jacket. When exposed to the wind I was wearing everything at the same time while touring and when I was protected from the wind and on the sun, I could remove the shell and be comfortable. Today was more spring-ish. Around 10 degrees on the sun and 0 on the north faces. Light fresh base layer, odin veor and shell. Again, I was very comfortable with the layer strategy today. My advice is that you still can go for it comfortable!